Airtight Solutions was founded in 2002, the brainchild of senior air pollution control engineers who realised there was a significant gap in the market that they could fill with their expertise. 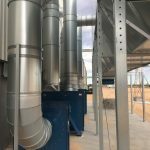 The engineers at Airtight have worked on a full spectrum of air pollution control projects from small to large across industries as diverse as minerals, foundry, dairy, mining and timber processing. The mid-tier market for air pollution control in Australasia was poorly serviced at this time, largely controlled by sales companies that focused on commissions instead of effective engineering and design. This meant that the only products available were ineffective, flawed and a huge waste of money. Sadly, such inferior products are still available on the market today, although Airtight Solutions is working hard to ensure their high-quality systems become increasingly available for clients throughout Australasia. Airtight Solutions is committed to offering the market well-designed, high-quality solutions that are affordable and reliable. Our company culture is grounded in integrity and respect, which is why we take pride in consistently providing the leading solutions on the market. With these values in mind, you can be sure you are investing in a system that has been designed by engineers, not salespeople, every time you purchase from Airtight Solutions. With the market’s best value proposition, quality, reliability and unbeatable performance, you know you’ll be getting the Airtight difference! Airtight Solutions have established our reputation as the leading supplier of air pollution control systems and filtration solutions for a diverse range of industries. By utilising our engineering experience and working with reputable suppliers, we are able to provide our clients with highly-effective, intelligently-designed solutions that are sure to provide reliable performance. Our vast range of products includes solutions for various industries including woodworking, automotive, minerals, timber processing, metal fabrication, food and pharmaceuticals, paper and packaging, seed and grain, cement, foundry and more. Our customer base includes small and large manufacturers, higher education facilities, builders and contractors, processing plants and government buildings. This demonstrates our varied skillset and ability to tailor solutions to practically any requirement. With a head office in Sydney and local warehouses in Sydney, Melbourne, Brisbane, Christchurch and Auckland, Airtight Solutions are able to provide a reliable and convenient supply of products, services, spare parts and engineering expertise. Contact our team today to experience the Airtight difference!